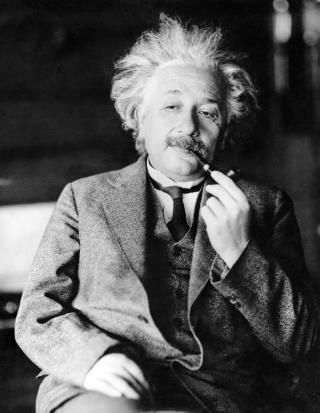 (Newser) – You really can put a price on happiness, or at least Albert Einstein's pithy theory on the matter: The theory, scribbled on a piece of paper and handed to a messenger, sold at auction for $1.56 million, AFP reports. The record-setting bid at Tuesday's sale in Jerusalem far surpassed estimates of $5,000 to $8,000, per Winner's auction house. Einstein scrawled the note on Imperial Hotel Tokyo stationery in 1922 while on a tour of Japan after being informed he'd won the Nobel Prize for physics. It reads in German: "A calm and humble life will bring more happiness than the pursuit of success and the constant restlessness that comes with it," per the BBC. The physicist better known for another theory gave the note to a courier who made a delivery to his room. Always... no, no... never... forget to check your references. I wonder what the note that Joseph Stalin sent to Ian Fleming in 1931, would be worth. "So we finish the eighteenth and he's gonna stiff me. And I say, "Hey, Lama, hey, how about a little something, you know, for the effort, you know." And he says, "Oh, uh, there won't be any money, but when you die, on your deathbed, you will receive total consciousness." So I got that goin' for me, which is nice."